© 2009 Hasbro. All Rights Reserved. TM & ® denote U.S. Trademarks. • Reorient or relocate the receiving antenna. • Increase the separation between the equipment and the receiver. insert them correctly by matching the + and – polarity markings. supervision. DO NOT RECHARGE OTHER TYPES OF BATTERIES. cover). Remove cover. Remove and discard old batteries. BABY ALIVE doll food is nontoxic and made of food-grade ingredients, but it is not intended to be eaten. If accidentally ingested, however, it is not harmful. 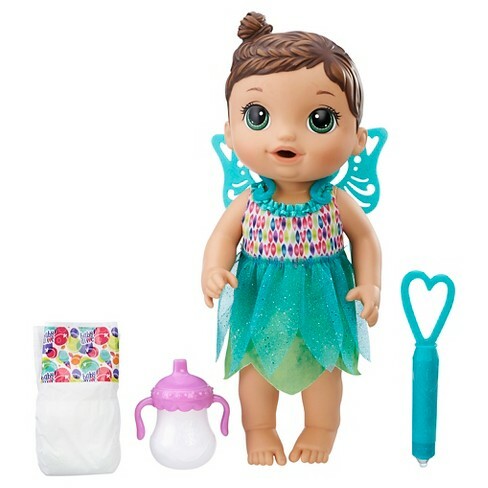 Use only BABY ALIVE doll food with your BABY ALIVE doll. Bottle contains magnet. centre. Do not dispose of in your household waste bin.